Discussion in 'General Freemasonry Discussion' started by Bro. Stewart P.M., Feb 11, 2012. Brother Oscar Allen, did indeed recieve all of his degrees within the jurisdiction of the GLoTX. Bro. 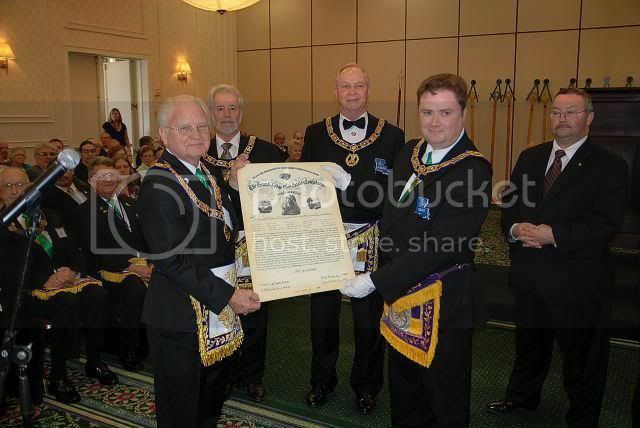 Allen was Raised to the Sublime Degree of a Master Mason in Waxahachie, TX. I feel that it is important to mention that along with the TX Brother, Six Past Grand Masters, and the current Deputy Grand Master will be affixed to the Charter documentation. (*) The Brethren have chosen to not operate in the SR Format at present. Please join me in congratulation theses Brethren!! O. K. Allen takes the oath of office (1932) on the steps of the Louisiana State Capitol Building in Baton Rouge, Louisiana. Governor Allen a native of Winn Parish, Louisiana, was a member of Eastern Star Lodge No. 151 F&AM in Winnfield, Louisiana. He passed away in the Governor's mansion in Baton Rouge in 1936 after a brain hemorrhage and is buried in the Winnfield City Cemetery.